Replacing a timing belt is a complex, but necessary process for keeping your vehicle running properly. You’ve probably heard of a timing belt before, or at least heard you needed it replaced, but do you know what it really does? At Chelsie’s Automotive, we’re happy to help you with all of your timing belt needs in Austin, TX, including explaining to you what they are! What does my car’s timing belt do? 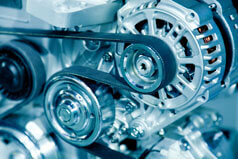 Your timing belt helps keep your car’s crankshaft and camshaft working together. The crankshaft converts the energy from the pistons that is required to turn your wheels. The camshaft controls the engine’s valves that allow air and fuel to flow in and out. Without a properly functioning timing belt, your valves and pistons would collide, causing potentially irreversible engine damage. When does my timing belt need to be replaced? Timing belts usually need to be replaced every 60,000 – 100,000 miles. Failure to replace a broken or worn timing belt can result in severe engine damage or even complete engine failure. We’re Austin’s timing belt replacement experts. At Chelsie’s Automotive, drivers have trusted us with all of their automotive repair needs and know that we provide the best timing belt replacement service in Austin. We only use strong, top quality belts to serve you with reliable auto repair that last. Replacing a time belt can be a complicated, labor-intensive repair, but our ASE certified technicians always perform quality and efficient service. We can properly install your new timing belt the first time, and have you back on the road quickly and easily! Give us a call today at (512) 920-6653, easily schedule your appointment online, or stop by today and find out why Chelsie’s Automotive is the #1 shop for timing belt replacement in Austin, TX!